The 2011 Geneva Auto Show has come and go, and left in its wake a bunch of crazy new cars, even crazier concept cars, and a general sense that the economy has turned around enough to make ultra-high end exotic autos a segment worth pursuing again. That’s a good thing if you subscribe to the common wisdom that cool new tech starts out in flagship products and eventually trickles down to the $25,000 4-doors that line our public roads. Or if you have $500k to burn on a supercar. Note that since I’ve already written about the Ferrari FF and the Pagani Huayra I won’t rehash them here, though both were on display in Geneva. Countless teenage boys had posters of the Lambroghini Countach on their walls back in the day. Some of them still swear by the Countach and will continue to do so no matter what Lambo’s design and engineering teams come up with next. I am not one of them. The Aventador is sick. Even if I had $379,000 earmarked to spend on a car, I would never own one; Lambos are too angular and menacing-looking for my tastes. But look at those front mounted, five-sided cheeks that pass for some sort of split-grill – they’re insane. Insanely awesome. Also? 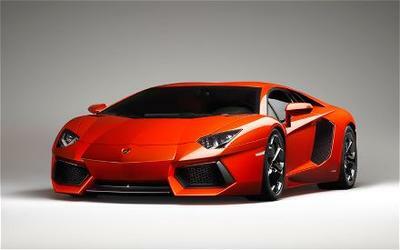 This Aventador emits 20% fewer carbon dioxide bits of junk into the atmosphere than the Murcielago it succeeds. That’s a nice little tack-on spec to sit next to 0-62 mph in 2.9 seconds, no? I live in the San Francisco Bay Area. I drive a Prius. I am, as Jon likes to say, dwelling beneath the “smug cloud” created by all of my “Aren’t We Sooooo Green?” kind. And so my maybe-within-reach dream car is currently the Tesla Model S, a kinda exotic, kinda practical, all-electric sports sedan. 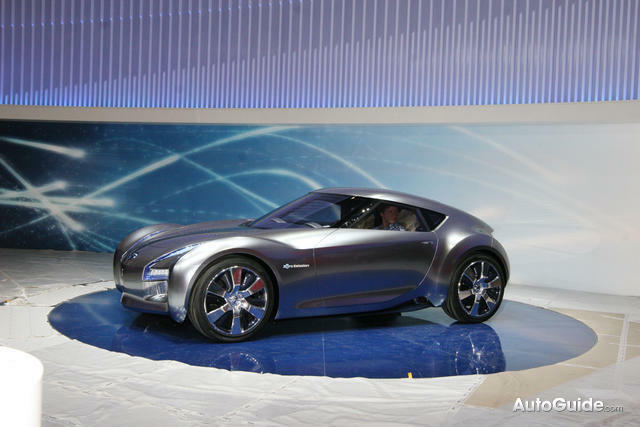 Now the S – and its two-seater sister the Roadster – has some competition by way of the Nissan Esflow. On the one hand Esflow is just a concept, but on the other hand it’s based on electric vehicle technology already shipping in the Nissan Leaf, so it’s a concept more production-ready than most. Kind of like a Z car with the EV guts of a Leaf on steroids, the Esflow concept is claimed to do 0-60 in 5 seconds with a 150 mile range. 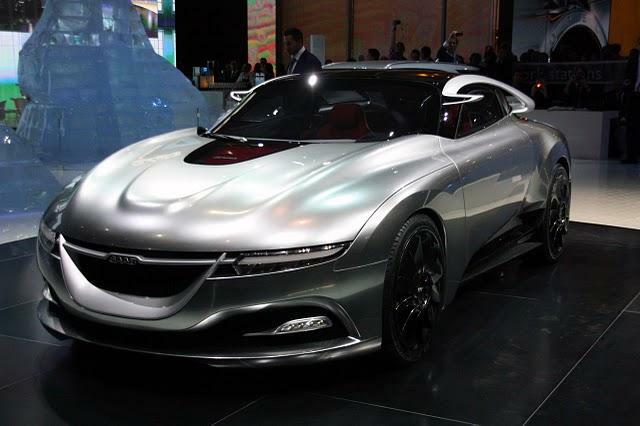 Also, it’s crazy looking like a muscle car from the future. A three-ton electric car that can hit 60mph in less than eight seconds. With more torque than the gasoline-powered vehicle it’s based on. And an induction charging system that lets you charge the thing but merely parking it atop an electrified pad. Rolls-Royce electrifies the Phantom, Grey Poupon not included. NOTE: That photo? 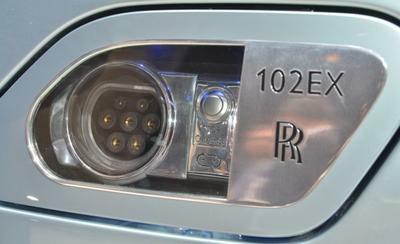 It’s the see through “gas cap” that covers the 102EX’s LED-bedazzled charging port. More photos of the car itself are over on CarAndDriver. When I was a high school kid in upstate New York, my dad bought a low-mileage, like new, used Saab 900 Turbo. It was metallic silver, it had a sunroof, and it was all kinds of fun to drive on the country roads near Ballston Spa and Saratoga, turbo lag be damned. My best friend’s dad had the SPG model; bonus points to anyone who knows what SPG stood for. Saabs have always been kinda odd, kinda quirky, and kinda polarizing vehicles, at least amongst car fans in the U.S. Me, I’m glad to see the brand back from the brink of death, even if I personally think this PhoneniX concept is terribly ugly. Except from the front. The front view’s pretty cool. Fanboy Firepower: PhoeniX’s infotainment runs on Google’s Android OS. Fact. 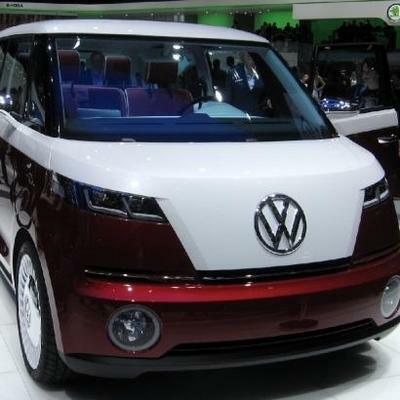 If VW makes this thing and makes it run on electricity like the concept does and makes it look retro-modern-digital-hippie like the concept does and I have a family full of rugrats when it comes out, I AM BUYING A BULLI. I’ll be that “retro guy” and I’ll drive the same car everyone else in my neighborhood does (we all already do, see: Toyota Prius, Dark Grey), and I’ll love it. This thing is cool. In a dumb, nostalgic, played out, totally awesome, has an iPad dock, life is meant to be fun kinda way. Here comes the inevitable eye-roll, groan inducing, Dad in the driver’s seat joke … wait for it … wait … for … it … Wooly Bulli! 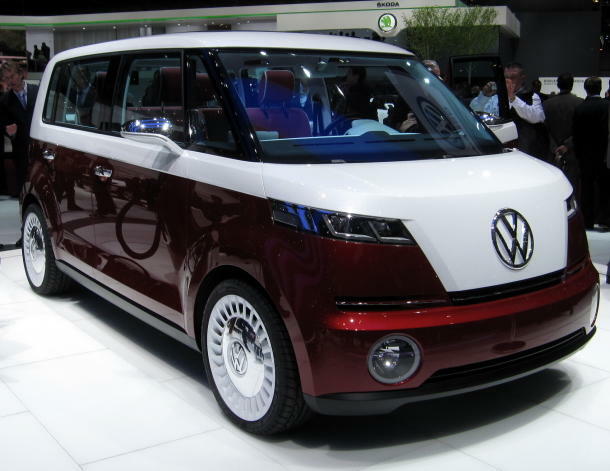 Enough out of me, you make the call: What was the coolest car shown off at the 2011 Geneva Auto Show. Yes, all the cars I decided not to mention are, of course, eligible – just add some links to them in your comments, please!